br clear="all">Doorway at the Boston University School of Theology. I like the way the doorway resembles that of a church, which in this case is appropriate. I imagine the students get inspired just going under that arch! Interesting photo. 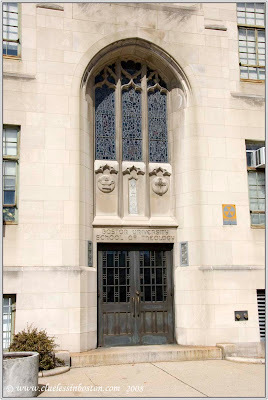 I first thought it was indeed this BU college's door was the one of a church too! It's a great idea for the colelge of Theology and as ramlbing round said, it's quite inspirational! Great picture! i always love Wednesday doorways! Alex, yes the yellow sign on the doorway is a marker from the Cold War days of the 1950s and 1960s. It was a time when a lot of public buildings were designated as places of refuge in case of a nuclear attack. Of course, that was before anyone realized how truly devastating such a war would be. Love that ... and the building itself. Awesome!